Families in Schools is an organization that works to involve parents and communities in our children’s education to achieve lifelong student success. 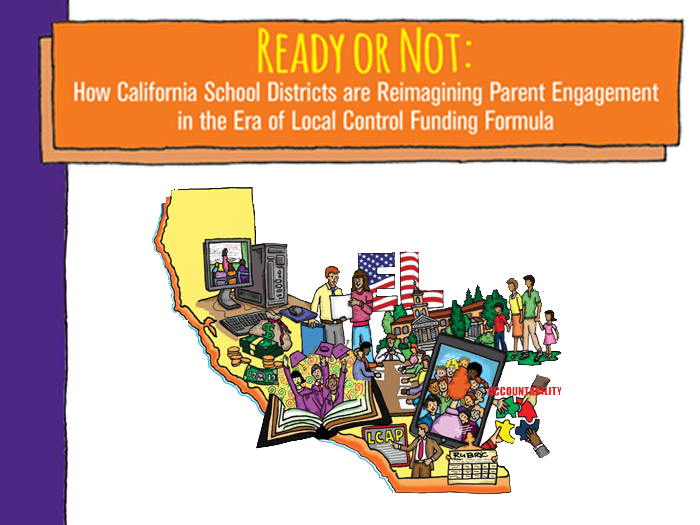 They recently published “Ready or Not: How CA School Districts are Reimagining Parent Engagement in the Era of LCFF,” a report which draws on thirty interviews with district leaders and staff members throughout California to explore challenges and the path forward for parent engagement. When California Governor Jerry Brown signed the Local Control Funding Formula (LCFF) into law in 2013, he elevated parent engagement to a legal requirement as well as one of the eight statewide education priorities in the LCFF. School district leaders now have a remarkable opportunity to reimagine parent engagement. Thirty school district personnel — including superintendents, school board members, parent engagement directors, and other administrators — were interviewed from fourteen urban and rural school districts of varying sizes throughout California. Engaging new and different parents. Abandoning the check-the-box culture among administrators. Training educators to engage parents effectively. Enlisting external support in parent outreach and capacity-building. Develop statewide standards for parent engagement. Build relationships and partnerships between parents and school staff. There’s a correlation between parent involvement and the positive relationships they share with schools and staff. Consider training teachers and parents together in the same series of workshops to develop shared understanding, trust, empowerment, and ultimately, partnership. Create teams of parents and educators that work together to examine key issues in school. Give teachers and parents the tools and data needed to build their LCAP programs and evaluate trends. Click here to learn more about LCAP. Invest funding and resources in parent engagement to meet LCAP goals. Success requires an investment of resources and programs; funding parent engagement appropriately will yield positive outcomes in student achievement and other areas. LCAP should provide concrete budgetary allotment dedicated to parent engagement activities. Investment should include human capital needed to perform effective outreach in hard-to-reach communities (new district or school site positions and resources). Ensure that specialized needs (bilingual staff, translation services) are taken into consideration. Partner with other community groups and other external organizations. Through partnerships, districts can leverage pre-existing relationships with parents that other organizations already possess. Form partnerships with community-based organizations, advocacy groups, universities, libraries, etc. Leverage training resources and programs across organizations to build capacity of district and school site staff. Seek partner insight on translating and adopting parent feedback into policy and budget decisions. Tailor programs to the different needs of parents. Provide varying levels of support to parents based on their needs and roles. Tailor parent engagement around language and cultural realities of communities within your district. Provide professional development on parent engagement. Train teachers, school staff, and administrators to understand and practice quality parent engagement. These skills can be improved with practice and strong coaching! Build professional culture that values and rewards effective parent engagement. Identify experts in parent engagement and position them as mentors to other staff. Embed parent engagement into annual professional development plans.